There are so many different types of rubber floor mats that can be used for many different purposes. Rubber is a durable material that can offer great longevity but it does need some attention and care every now and then. The rubber mats in your car are usually very well used and taking them out to do a regular cleaning will help you maximize their usefulness and extend their life. In Canada, the winter months can be especially hard on your car mats, so consider adding this task to your Spring to-do list. Remove the rubber mats from your car so you have full access and can clean the dirt on all sides of the mat. A process similar to what is used for cleaning industrial rubber mats is a good method to follow, using a gentler soap for this purpose. Take a minute to examine your mats. 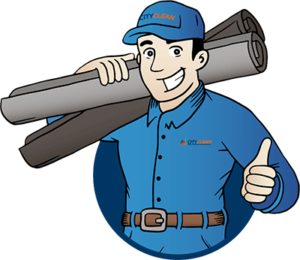 If you notice cracks or damaged areas in the mats, it is a good idea to replace them. Uneven mats or edges that stick up can easily get caught under the pedals or on footwear. Shake off any excess dirt, crumbs or garbage from all of the mats. You can give them a quick vacuum to remove as much surface grime as possible. Choose a mild soap designed to wash rubber and mix it with water. Cover the rubber mats with the cleaning solution and use a strong hose spray or a pressure washer at the lowest level to try and bust up some of the tougher dirt and stains. Take a brush with stiff bristles and scrub the mats to remove the dirt. Choose a brush that will fit into the grooves and crevices of all the mats. Spray the mats with a hose one last time to blast off the dirt you were able to scrub clean. Wipe down the mats with a soft cloth. It is best not to leave the mats to dry in the sun as this can be hard on the rubber and will expedite cracking and fading. If you’d rather have them air dry, choose a nice and shady spot out of the direct sun. For an extra special touch, you can put a treatment product on the mats once they are dry that will repel water. You need to be really careful about which product you pick though as you don’t want the mats to be slippery and cause issues while driving. Rubber floor mats are a great way to keep surfaces clean but you can’t ignore them! Regular maintenance and care will go a long way in protecting the surface underneath the mat, help your car look great and keep the mats you use in good condition. 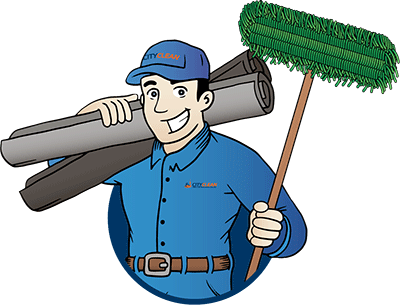 For more than 40 years, City Clean has been providing rubber mat services to the Greater Toronto Area. 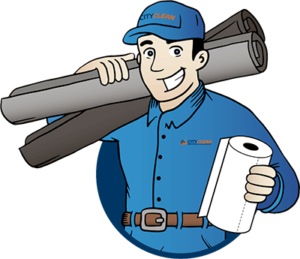 We’re passionate about keeping businesses clean and customers and staff safe. For more information on how we can help, contact us!